It was a battle of second and third in UBC’s Canada West semifinal this weekend, as they hosted the Alberta Golden Bears in hopes of moving on to the conference final. 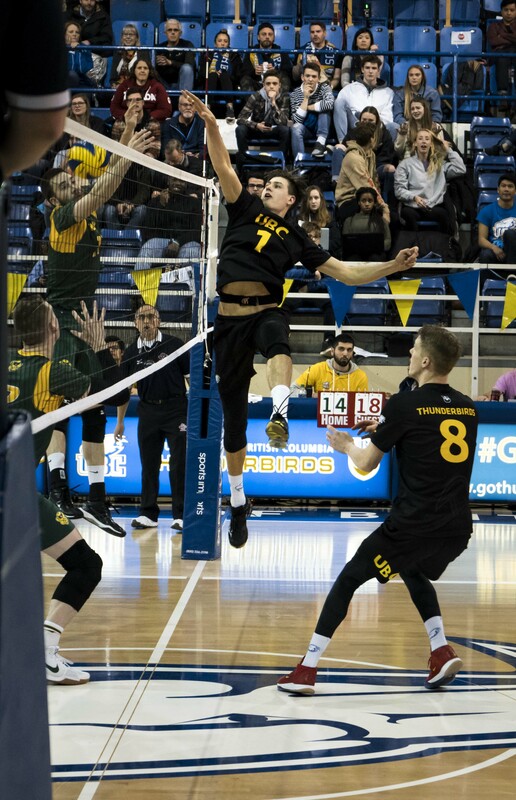 Though it would be two tight, close-fought games between the Canada West heavyweights, the Golden Bears would come out on top, taking the first game 3-2 and the second 3-1 at War Memorial Gym. 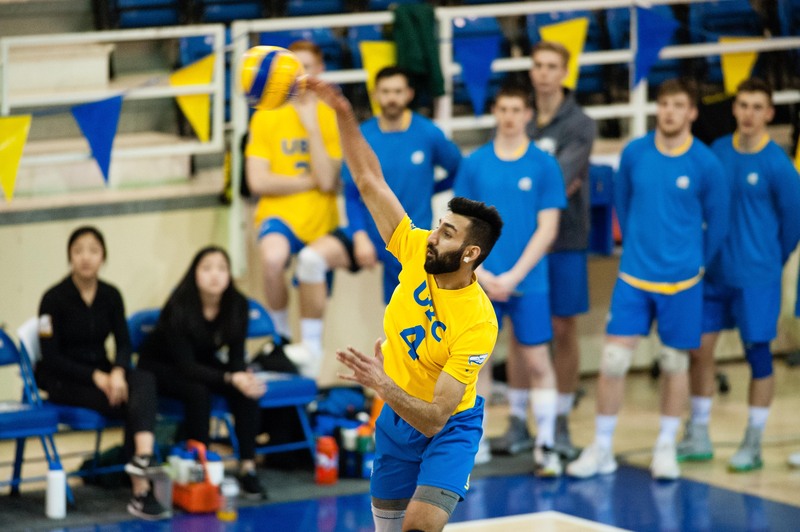 UBC volleyball fans were on a rollercoaster Friday night as the men’s team faced off in game one of their semifinal against the University of Alberta Golden Bears. After a dramatic five sets, the T-Bird’s dropped the ball as the Bears took it in the fifth set, 15-13. There was nothing easy about Friday night as the two teams merely picked up where the left off — the game was reminiscent of a tough weekend split with the Golden Bears in November. The teams would trade rally point at the beginning of the first set. Tied 7-7, Alberta quickly took advantage of efficient killing, energized by Taryq Sani and Alex McMullin. With almost double the hitting percentage, Alberta took the set in their favour, closing it 25-17. It wasn’t until the second frame that the ’Birds looked like they had finally found their rhythm. UBC jumped out to a 3-1 lead but slowed down until it was 7-7. They would go ahead by two midway through the set and continually build on that lead from there, winning the frame 25-18. UBC’s offence has always relied on their serving system, which going into the third set was thoroughly crushed. After an early 7-3 lead, the Bears would slowly whittle it away until tied at 17. A game-high record of eight errors provided ample opportunity for the Bears to take a late set advantage. First tied 24-24 and then 26-26 after stopping the ’Birds twice on their set point, the ’Bears finally finished the set 28-26. Solid back-row attack in the fourth from Fynn McCarthy added strength to the T-Birds offence. In tandem with Irvan Brar’s blocking prowess, the ’Birds’ momentum took them to a 16-12 lead. The T-Birds then slowly widened the gap to 18-13, finally finishing the set 25-17. The fourth set was a cleaner execution of the game plan as the T-Birds reached their game-high hitting percentage of 58 per cent and 16 kills — and with only two errors. Three critical errors in the fifth set would be enough for the Bears to take game one. UBC tied it twice 7-7 and 11-11 as service aces from Byron Keturakis gave them hope. But Alberta’s three-point run would swing the pendulum in their favour as the visitors claimed victory, 15-13. McCarthy was awarded the player of the game with 18 kills and 3 aces, followed by Jordan Deshane and Brar with 15 and 11 kills. In their do-or-die semifinal match-up on Saturday night, UBC would flounder under some incredibly tight sets to seal their defeat against the Golden Bears — a lacklustre end to a weekend where UBC perhaps wasn’t playing at the top of their game. 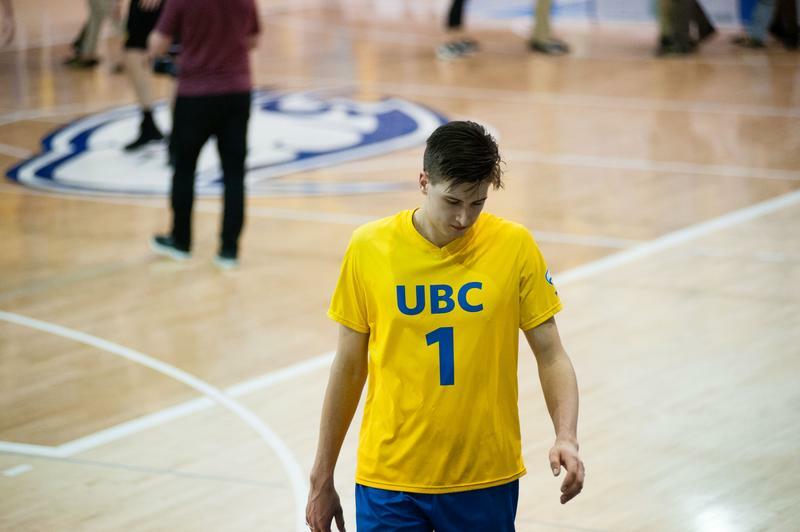 “Hats off to them, they played a really complete match and they made us have to be our best today — and we weren’t our best,” UBC head coach Kerry MacDonald said. For the Thunderbirds, decision-making at the net got them off to a solid start in the game. That said, Alberta’s outside attacks exploited the T-Birds D in the corners of the court to keep them within closing distance. It was a tight set, as the teams traded points back and forth. Good setting would be the key for the T-Birds to take the early match lead, as they opened up Alberta’s blocking to help them stay ahead. Though there were some miscues on execution, UBC would take the first 25-20. In the second, UBC would have to bounce back quickly after dropping the first two points to the Golden Bears. Though they would go on a four-point run to take a marginal lead, Alberta would close the gap and the set would stay tied through most of its first half. From there, the visitors’ blocking improved dramatically as they started to read UBC’s sets, while long rallies would also fall in their favour — putting dents in the Thunderbirds’ roll. A final serve from Brar would end up hitting the net, giving Alberta the 25-23 set win. UBC’s continued hardships on the service line for the evening continued into the third, as several players struggled to get the ball over the net. 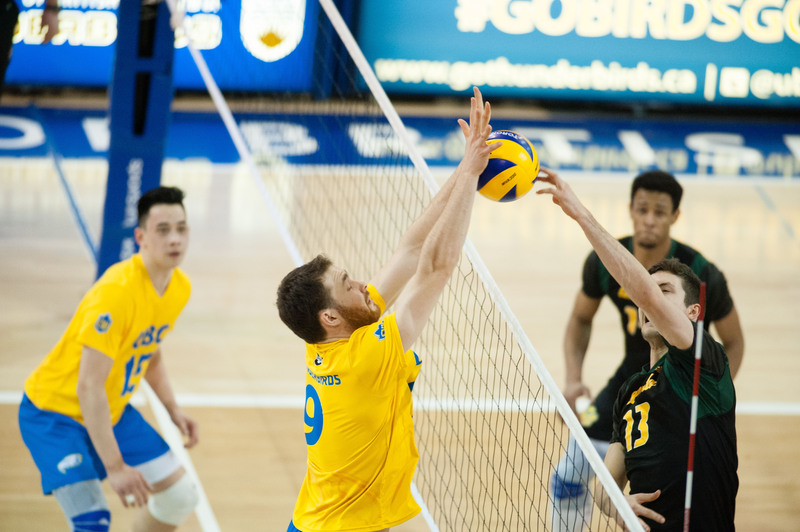 The ’Birds also failed to get kills through the improving Alberta blocking line, and little miscommunications on their own defence would cost them some valuable points. Though they fought hard to get back into the set, Alberta would again take the win with a marginal 25-20 lead. Though it was a must-win set for the T-Birds in the fourth, both teams came out all guns blazing. UBC was working hard, but seemed to be forcing shots as desperation set into their play. On the other side of the court, Alberta was covering well and giving UBC no room to play with. With frustration setting in, UBC would drop a few points to their opponents midway through the set — a problem they would remedy with several potent cross-court shots. With the set knotted at 22, UBC would unfortunately drop a few key points again, giving Alberta the 25-23 set and match win. With the loss, UBC settles for the bronze medal match in Canada West, to be hosted at UBC on Friday, March 9 against the Winnipeg Wesmen — a team they have already defeated twice in the regular season. “We are a fairly resilient group and we are a team that played a lot of five-set matches last year and came out on the positive end of a lot of those, so we are used to being down,” MacDonald said of his team moving forward through their tough playoff schedule.